Take Responsibility and Mind your Bits! Wow! I’d like to address the topic of Cervical Cancer, a topic that should be addressed anytime not just in January! 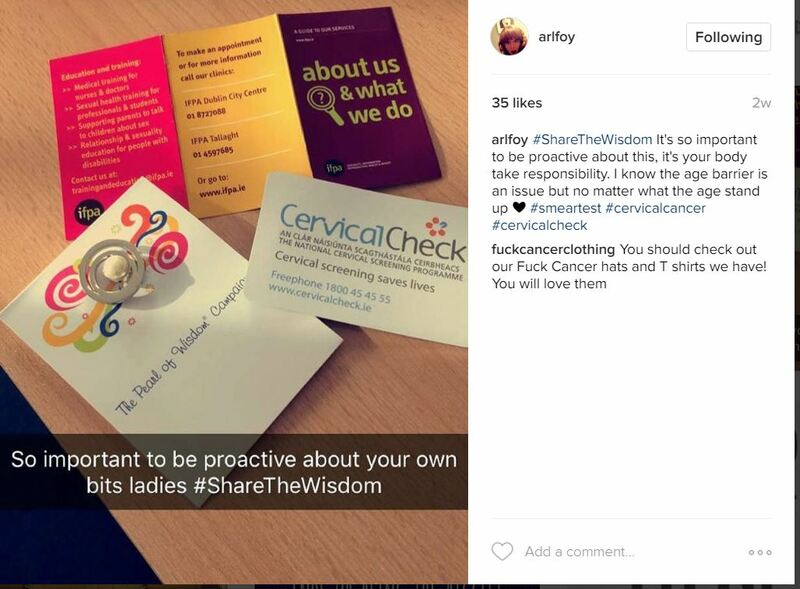 This blog is prompted by a recent prospect meeting I attended, where I received a Cervical Cancer Awareness brooch representing the ‘Pearl of Wisdom’ with a clever hashtag #ShareTheWisdom. Although prompted by the brooch this blog is one of personal experience and a result of my lack of responsibility for my own body, which led to an experience I never want to go through again, mainly because I did not know what to expect. I visited my doctor because mother nature had gone AWOL and this resulted with me getting an unplanned smear test. The last thing you expect to get are negative results, which only scream the word CANCER in your head. For an over-thinker like me this was not going to sit in one little place in my mind..Oh no! This was going to spread into every little space that has never ever been filled with, well anything (even the science/maths section). I thought about the dreaded results so much that I ended up being a miserable mess and crying on my dear brother’s shoulder, mainly because my mother would have thought this was the end for me!! We can be quite dramatic sometimes but I’m afraid this is the reality of when you know nothing about cervical cancer. I was called for a Colposcopy – not only could I not pronounce it but it’s not the fluffiest of words either, so this was quite daunting. I roped one of my closest friends into coming with me and we went up the night before (this of course was Valentine’s Day, so quite inappropriate!). The next day I went to Holles Street Maternity Hospital where everyone was very helpful and I got all the information I needed. I had a treatment called LLETZ, which removed the abnormal cells on the cervix under local anaesthetic using a very fine, heated wire loop. At this time they also tested for the HPV virus. Afterwards I felt quiet tired (the effects of the anaesthetic) with a slight discomfort and I won’t go into everything else but a few days rest and hugging myself was in order to get me back on track. When my results came back they were all clear and I can’t describe the incredible feeling of relief when opening that letter and reading those words. I would be called back in six months for a follow up smear test to check that everything was okay, which thankfully it was – phew and finally the mind rests! Thanks to my doctor, I was lucky but also I believe as women we know our own bodies and mine was telling me that something was up, just like you know when a tummy ache is coming on. If that little feeling is playing on your mind do not let it lie – GET CHECKED! Of course I am aware that one of the issues in relation to cervical checks is the age barrier for public health benefit. Young women under 25 years can be affected by cervical cancer but they are not covered via the public system – It can’t be too cheap to get this done and many may not have the cash. However it is important for us all to be responsible and proactive about our own bits. If you are under 25 and feel something is not right don’t put it off, speak to your doctor and get yourself checked. Don’t overthink and let it flood the science/maths section of your brain – Get checked as it could just be one of those life changing decisions.